Maps made to help the government control the confiscated estate of a notorious Jacobite have been made available to the public online. 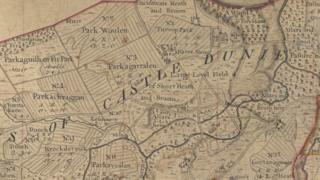 They are among more than 400 maps belonging to the Lovat Estates near Beauly in the Highlands. After the defeat of the Jacobites at Culloden, the British government took control of the estates of the 11th Lord Lovat, Simon Fraser, who was known as the Old Fox. Fans of the Outlander books and television series will be familiar with the character, played by Scottish actor Clive Russell. He was beheaded for high treason in 1747 because of his support for Bonnie Prince Charlie. Was headless woman a wealthy Londoner? In the years after the Jacobite rebellion, a government body called the Commissioners for the Forfeited Estates met and wanted to know what lands they now administered. The oldest of the maps in the Lovat estates online project were created on the orders of the Commissioners. The maps were used to "modernise" the estates through agricultural improvements and new industries in the hope this would help weaken the Jacobite sympathies of local people. When the land was returned to the Fraser family in 1774 they continued to commission new maps. These covered vast areas stretching from Inverness in the east to Mallaig in the west. They were used to plan developments such as the construction of roads and bridges, the village square in Beauly and the building of the North Highland railway line. Until recently the maps had been stored away in the archives of the Lovat Estates. Some of them had not been looked at for decades. Roland Spencer-Jones, the chairman of the North of Scotland Archaeology Society, realised their historical significance when he was given access to the maps to help with research into a small abandoned settlement at Urchany, west of Beauly. He said he was amazed when he saw just how special they were. Mr Spencer-Jones said: "The maps are unique works of art, which show a snapshot in time. It was a real joy being in the estate office, opening drawers, taking out maps and unrolling them." He said: "They were created entirely by hand and they are beautifully drawn and often painted as well. "The skills needed to both survey the land and then convert that to a map were very sophisticated." Mr Spencer-Jones discovered that five of the oldest maps in the collection had been made by one of Scotland's leading mapmakers, Peter May, in the aftermath of the Jacobite rising of 1745. With their historical importance now fully realised, the management of the Lovat Estate agreed the maps should be made more accessible to the public and hired specialist scanning equipment. Volunteers from the North of Scotland Archaeology Society then created digital images of the maps and the National Library of Scotland has made them available online. Mr Spencer-Jones said: "It seemed a wonderful idea to get these maps a bit more in the public domain and allow them to be viewed by lots of people. "It has been very satisfying to go through this process of opening maps that hadn't been seen for many decades and now seeing them on a website." Iain Shepherd, a director at Lovat Estates where he has worked for 27 years, said the estates were unaware they had one of Britain's most comprehensive set of estate maps tucked away in their archives. He said: "I had no idea of the significance of these maps or to be honest the age of some of the maps. "It has been really quite enlightening to see the wealth of information we have. It was a huge amount of work scanning all the manuscripts but the end result is fantastic. "You can now zoom in and see all the individual trees and the brush strokes of the mapper. It will be great resource for historians and archaeologists. "I hope other estates will think about doing the same thing with their historic maps." Mr Shepherd added: "One interesting thing for us is that there are a huge number of forgotten Gaelic place names on these maps. "The Peter May maps in particular have names for individual fields in places and we have been wondering about reviving some of these old names for some of the steading conversions we have been doing on the estate." Mr Shepherd said he was fascinated by the political dimension of the maps made after the defeat of the Jacobite army at Culloden. The maps mark out the Lovat Estates as being in North Britain, rather than Scotland. Christopher Fleet, map curator at the National Library of Scotland, said the maps had a "very clear political and economic agenda". He said: "The early maps that Peter May made in the 1750s for the Commission for Forfeited Annexed estates blend the artistry of mapmaking with scientific information that was necessary for his employers. "The commission were very interested in agricultural improvement, in enclosure, in drainage, in really the extension of a cash economy into the agricultural scene of the area. "At the time in the Highlands the focus was very much on transforming the economy in order change attitudes that were very sympathetic to Jacobitism. "So at one level you have got a lot of military schemes like the construction of Fort George at Ardersier and the various efforts to suppress Jacobitism in terms of culture. "But what the board for the forfeited annexed estates were very interested in was trying to encourage all types of new economic activity so the inhabitants would feel they had more to gain from siding with broader economic forces rather than traditional values." A Fox's Tale: Who was Simon Fraser, 11th Lord Lovat? The clan chief, the last person to be beheaded in Britain, is recorded in history as a charmer who was prepared to switch sides during and around the times of the Jacobite uprisings. But the last of those risings, in which he supported Bonnie Prince Charlie, ended in defeat for the Jacobites at Culloden in April 1746. The following year, Lord Lovat was executed at Tower Hill in London. It is said that several people who had gathered to watch the beheading died after the scaffold they were on collapsed. Lord Lovat found this incident funny and was said to have been so visibly amused when he was executed that his death led to the phrase "laughing your head off". The Old Fox is a figure familiar to fans of Diana Gabaldon's series of Outlander books. In the author's time-travelling, romantic adventure stories, he is the grandfather of Jamie Fraser, one of the books' lead characters. Scottish actor Clive Russell plays The Old Fox in the television adaptation of Gabaldon's novels.